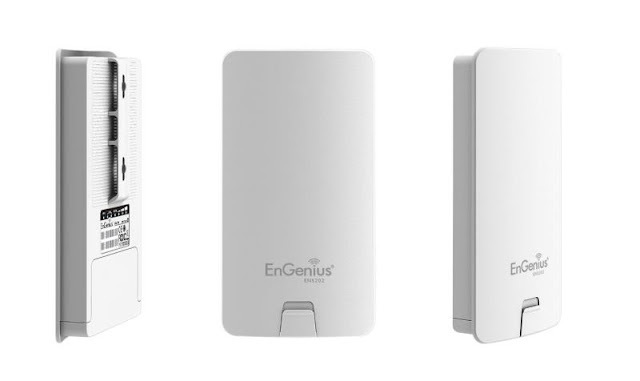 Go Wireless NZ Blog: Creating an EnGenius AP WDS Bridge with WPA2-AES security. Creating an EnGenius AP WDS Bridge with WPA2-AES security. Setting up a WDS repeater bridge using Engenius ENS202. Once you login, the first thing that needs to be changed is the Operation Mode under "System". In the "Operation Mode", change the "Device Name" to anything you like. The "Country Code" can be New Zealand as we are going to set a manual channel later on. 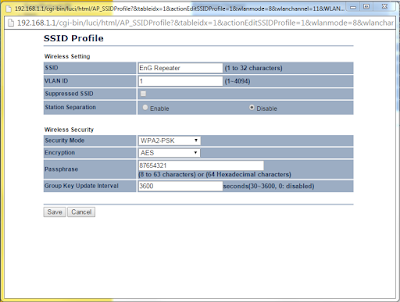 Under "Operation Mode", select "WDS" and then "Access Point". Save the settings by selecting "Save & Apply". Also under "System" we will need to set the "IP Settings". We will configure the ENS202's to be on 192.168.1.200/24 and 192.168.1.201/24. Set the Default Gateway and Primary DNS to 192.168.1.1 (the default IP address for Vodafone modems, Spark modems are usually 192.168.1.254). Select "Accept" and these setting are now locked in ready to be saved once all the other settings are accepted. We now need to configure the "Wireless" settings. 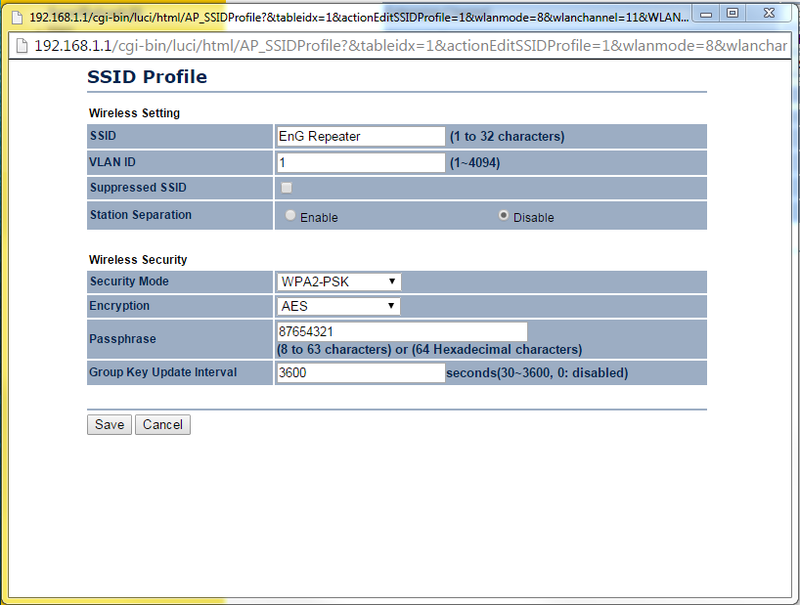 First, we need to configure the "WDS Link Settings", the WDS encryption and MAC address of the WDS peers. The "AES Passphrase" will need to be the same on both ends of the link. The MAC addresses configured in here need to be the Wireless MAC address of the device it is connecting to. (ENS202#1 puts the MAC address of ENS202#2 and vice versa). (You can have up to 4 units repeating off the main AP in a star topology). Click "Accept" to lock these settings in. We now need to configure the "Wireless Network" settings. Set the "Channel HT Mode" to 20MHz, which is the channel width most commonly used by client devices such as Smartphones and Laptops. The "Channel/Frequency" needs to be manually set to either 1, 6 or 11, so that the channel is the same on all of the repeaters (in this example we've set the units to channel 11). Click "Edit" on SSID 1. Set the SSID to anything of your choosing. "Security Mode" should be WPA2-PSK. "Passphrase" needs to be a minimum of 8 characters and can be anything of your choosing. Everything is ready, now we need to save all of the changes. Select the "Save/Reload' option at the top under "Status". This will take around a minute to complete. The best way to test that both ends are working correctly is to set a different SSID on both units. Connect to both and check to see you can get to your default gateway. Also do not link the ENS202's together while they are both connected to your main network or you will create a network loop which will cause major issues. These are the base settings you need for the AP's to start communicating and broadcasting. We recommend configuring a new username and password. By default the output power is set to 20dBm (100mW), this can be turned up to 26dBm (400mW). If you are creating a hotspot, client isolation is recommended. We would also recommend spanning-tree to prevent network loops.